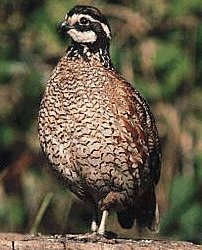 The popular Bobwhite Quail is a favorite of game bird breeders, just about everyone is familiar with male's call for which the species is named. These little birds have the most widespread range of any quail species, with over 20 subspecies ranging from Canada to southern Mexico. The most common subspecies is the Eastern Bobwhite (C. v. viriginaus). They are found in a variety of habitats, from open woodlands & fields to suburban parks. Bird feeders in the yards of some greet a few quail who come to feed on the seed that is dropped by the other birds. Males have a white throat and eye-line, with a dark crown and a black line that separates the white on the throat to the eye-line. The lower breast is mottled white & dark brown; sides have light brown streaks and the back and rest of the body mottled brown overall. The hens are similar, but her throat and eye-line is buff and her overall color is somewhat lighter. They form large groups during the winter called coveys that can consist of up to 30 or more birds and when disturbed they will burst into flight at once. Breeding Bobwhite Quail Bobwhites present no problems in captive rearing, and can be produced easily in modest surroundings or large aviaries. You can choose to colony mate - several hens with two or three males, trios -one male with two hens, or in pairs. Bobwhite hens begin laying in mid April and may lay all summer long. 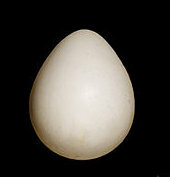 The eggs are pure white and are incubated for 21 days. Artificial incubation is used with this species, as captive hens are unlikely to go broody in a cage setting. Bobwhites can also be induced into laying earlier than normal using artificial light and to have hens produce eggs year round. Chicks are easy to raise in the brooder. They require a high protein diet and lots of room, as they are very active and can be prone to picking if overcrowded. The chicks are kept in a brooder setting for about six weeks, then they are moved to covered, outdoor enclosure. Bobwhite should be fed a good quality game bird ration of at least 16% to 20% protein also supplement with various grains, greens and mealworms. Copyright © Game-Birds.com. All rights reserved.